PowerNet is a smart electrical engineering design and analysis software for electrical contractors, consultants and other electrical engineering organizations. Use it for medium to large projects requiring an easy to implement and easy to use software. Electrical projects such as commercial building services, industrial plants, mining operations, as well as power generation, transmission and distribution systems.PowerNet can calculate ring main or meshed network configuration as well as radial type distribution. Use it to design and analyze electrical systems with multiple voltage levels, from high voltage transmission through to distribution levels down to low voltage utilization voltages.PowerNet Circuit functions and features:Draw and print single line diagram.Display complete electrical data including node voltages, voltage drops, branch current, kVA, kW and kVAr flow.Evaluate the effects of disconnected devices and branches on the rest of the circuit.Calculate three-phase, line to ground, line to line and double line to ground fault. 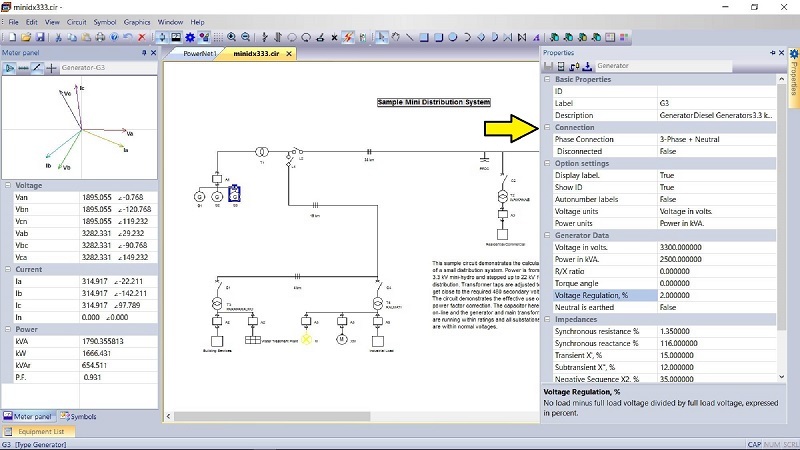 Include motor contribution to fault.Mouse-over display of symbol electrical data.Click any symbol or line to display voltage and current vectors.Create or modify symbols.Highlight symbols with overcurrent, kVA/kW overload, over/undervoltage.Use graphics to annotate and add legends, title blocks, logos to the single line diagram.Circuit report text format compatible with MS Word, WordPad, OpenOffice.Circuit report spreadsheet format compatible with Excel.PowerSym, a symbol editor tool is supplied free with PowerNet. Use it to edit the standard symbol set file supplied with PowerNet, or create a new file. PowerData is also supplied free. Use it to edit or create database for electrical equipment, cables and devices. For more information, browse PowerNet Web Help. Scientific Calculator Decimal for scientists, engineers, teachers, and students. Symbols can be entered by clicking buttons and/or using keyboard and num pad. Calculation history can be stored into text file and printed.